Gable? Shed? Flat? Hip? 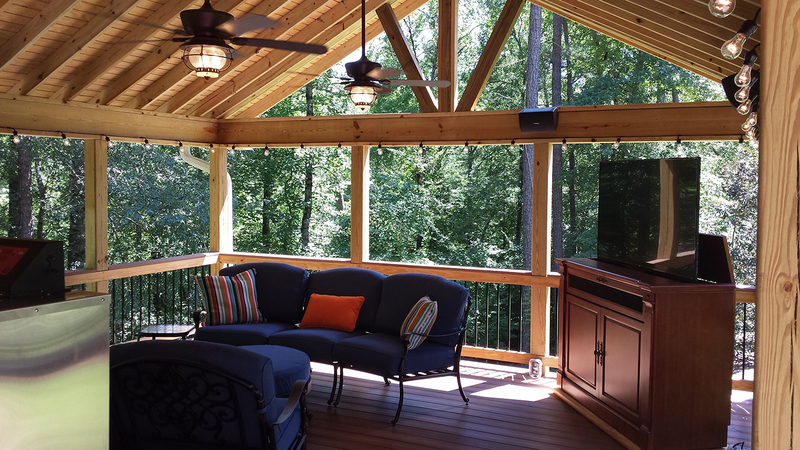 What is the best roof for your new Central GA area porch? What are the factors and how do you decide? 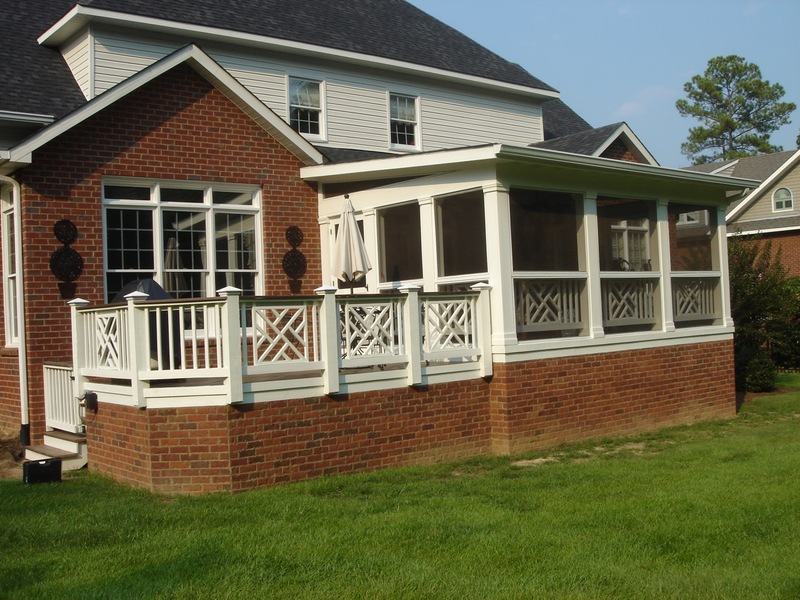 When homeowners come to us looking to add a screen porch, open porch, 3- or 4-season room or sunroom to their home, one of the first things we discuss is where the room will be and what roof shape it should have. Quite often homeowners request a gable roof atop their new room. A gable roof has a high point and slopes downward in 2 directions from that high point. This effectively makes a triangle shape. It’s reminiscent of the pictures that young children draw where a square represents the house and the triangle atop represents the roof. There’s a good reason for it to be a preferred style. A gable roof creates a vaulted ceiling from the inside. Vaulted ceilings allow more light to enter and pool in the room. 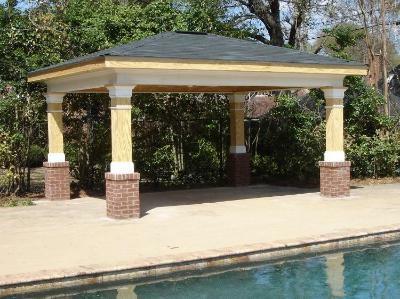 If you’re looking for a backyard room or roofed structure addition, you most certainly want a bright and cheery space and this is just one of the roof shapes that will help you accomplish that goal. Here is the challenge. A gable roof doesn’t work with every home. We love the gable roof for its height but we cannot allow the height of a room addition to infringe on the view from other rooms within the house. If you have a two-story home with quite a few windows on the second story, it’s likely that adding a gable roof room addition on the back of your home will reduce or eliminate the view from those upper story rooms. You do not want to look out of your bedroom window only to see shingles from a roof. When we come out for your consultation, we will look at all the options with you so it’s important not to count anything out until we look at it together. A shed roof is connected to the house wall and slopes downward from the point of the connection. It essentially creates a half triangle when you look at it from the side. 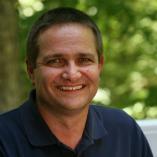 A shed roof option is often used exactly when the above scenario exists. Let’s say you have a number of second-story windows that you don’t want to infringe upon. Often you can attach the roof below the windows having it slope downward from that point. This allows some elevation in the interior ceiling creating a slightly vaulted effect. The ends of a shed roof can be left screened or finished with glass to ensure even more light enters the room. The porch roof pictured above has a very shallow shed style roof. You can see that the second-floor windows limited the roof options. You can also see that the home facade included a gable on either side of the porch area. Vertical obstructions may not be the only architectural constraint. Before we start discussing flat roofs, we are going to dispel one of the prevailing misconceptions about flat roofs. People feel that water will pool and stand on a flat roof. Our flat roof designs are engineered to have enough slope and proper draining to ensure that water drains successfully from the roof. A flat roof is a great option for aesthetic appeal, especially here in the south. 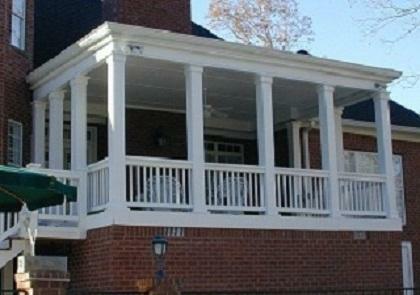 Residences and structures throughout the south can often have sitting porches along the front, sides or back of the home. Quite often these open sitting porches have a flat roof. This roof shape is very appealing as you see above. You may suspect from reading this blog that the common factors influencing roof selection are obstructions whether vertically or horizontally. Single story homes also require significant consideration when selecting the roof shape as it relates to being a good fit with the existing roof. We want your new room to look as if it was built with your home. This requires matching the trim and gutter lines. It also includes ensuring the house roof and porch roof complement each other making it appear that the porch or sunroom was always there. A final option roof option is a hip roof. This roof shape is a more complex option from a construction standpoint. It has a high point and descends down from that high point in 4 or more directions creating a 3-dimensional shape. Selecting this roof shape depends on your goals for the room and is also heavily influenced by the constraints mentioned above. A hip roof may be used to match or complement one or more hip roof elevations on your existing home. Above you’ll see a free-standing cabana with a hip roof. This roof has a very pleasing aesthetic. A downside includes that it may be a little more expensive because the architecture is more complex than some of the other roof shapes. It’s always important to remember that you’re making design decisions for a room you will use for many years in the future so make sure it’s what you really want. 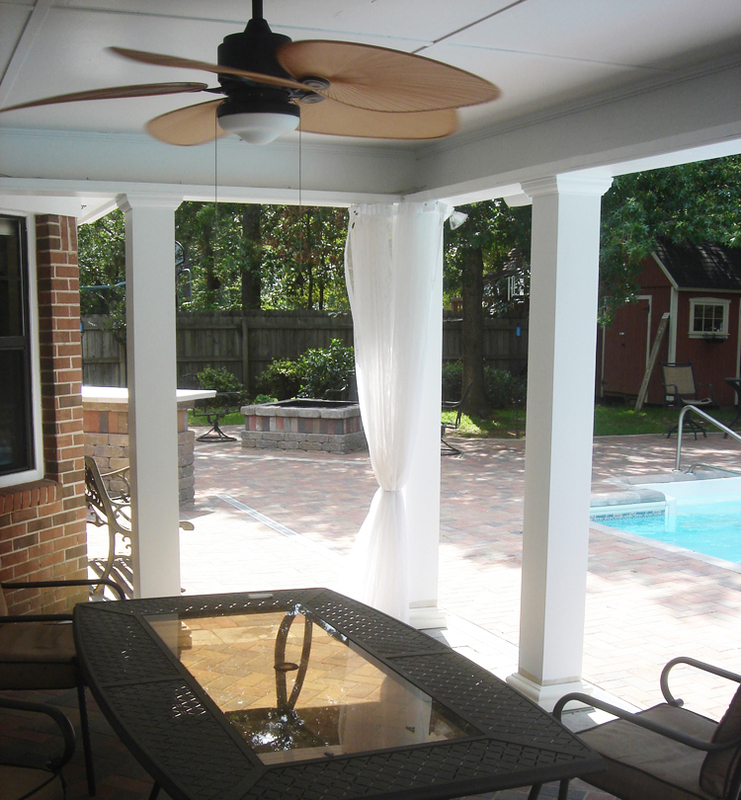 If you’re considering adding a new porch, 3- or 4-season room or sunroom to your Central GA home, contact us for a free consultation. Call us at 478-745-2000, email us or fill out the form on this page and we will quickly get in touch with you.